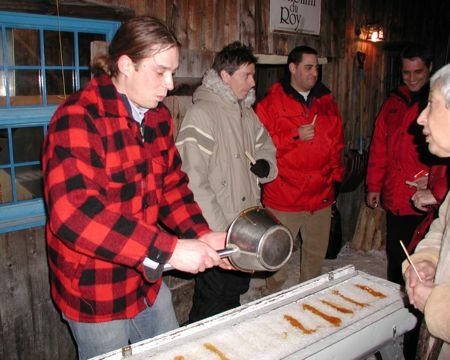 I'd never heard of a Sugar Shack until I went to the Quebec Winter Carnival several years ago. After a day of reveling in the snow, we drove 15 minutes outside of Quebec City to le Chemin du Roy. The main sugarhouse or sugar shack at le Chemin du Roy was built in 1925. It's located in a maple grove originally owned by hockey legend Guy Lafleur. Today, owner Real Boissoneault runs it as a tourist destination, and it's a fun spot to visit. Especially in winter. We had tickets for the Maple Sugar Shack Package (around $20). Chemin du Roy's spacious shack can hold up to 200 people, and we shared a large table with visitors from Mexico, China and the US. The evening includes traditional music (yes, you can dance!) and a Quebecois meal of French Canadian pea soup, maple smoked ham, meatballs, meat pie, baked beans, homemade pickles, coleslaw and pancakes with maple syrup. My favorite part was making maple taffy on snow -- and eating it of course!